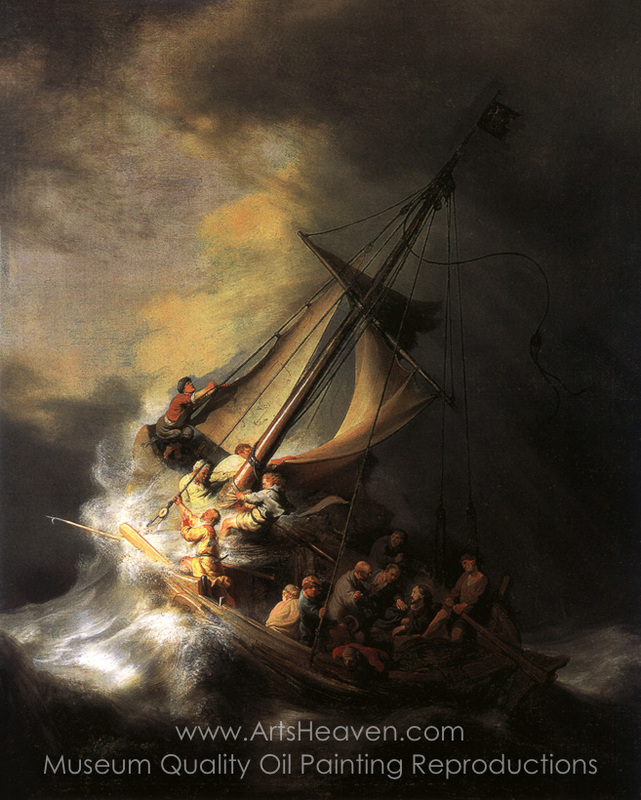 Once one of the crowning jewels of the Isabella Stewart Gardner Museum, Rembrandt's Christ in the Storm in the Sea of Galilee vanished into the Boston night in 1990. Possibly the most notorious art heist remaining unsolved, the shameless theft changed the way museums protect their collections, and the loss of many great works is still mourned by art lovers worldwide. Making off with Vermeer�s Concert, a number of works by Degas and a Manet, the thieves also managed to disappear with three Rembrandt works, cutting two of the canvases out of their frames when they could not take the hefty masterworks off the wall. Even more poignantly, Christ in the Storm in the Sea of Galilee is Rembrandt's only seascape. In remembrance of this significant loss, the Isabella Stewart Gardner Museum continues to hang its empty frame from which it was cut over two decades ago. Painted in 1633, Christ In The Storm On The Sea Of Galilee was the fruit of one of the most productive periods in the young Rembrandt's early career. Having just made a decisive move to Amsterdam, the painter attracted the attention of a number of patrons and secured a number of important commissions. Without doubt the commissioner of this particular work requested a canvas rich in drama expressed through a Biblical scene. Choosing a tale from the Gospel of Mark in the New Testament wherein Jesus calms the sea of Galilee before his followers are drowned, Rembrandt forged a painting of tremendous enduring power, featuring a staggering depth of feeling and emotional resonance. Like the fragile craft depicted, the artist's painting takes the viewer on the same turbulent journey before the inevitable redemption. With studied nonchalance, the figure of Jesus sits calmly while all but one of the boat's occupants, the twelve apostles, hang on for dear life. Yet the fourteenth occupant, the only other calm figure, stares out with serenity at the viewer. A brief comparison with a number of his self-portraits leads many to assume that the fourteenth figure is Rembrandt himself, gazing with a wry knowledge of his own fate in this tale of faith and endurance. Mesmerizing in its coloration, scale, and sense of movement, Rembrandt's Christ In The Storm On The Sea Of Galilee shimmers with the ethereal light of an internal, spiritual world. Counterposed with the studied calm of self-belief, Rembrandt's tiny followers at the mercy of nature is one of the most accomplished narratives ever committed to canvas that, tragically, cannot be experienced firsthand. 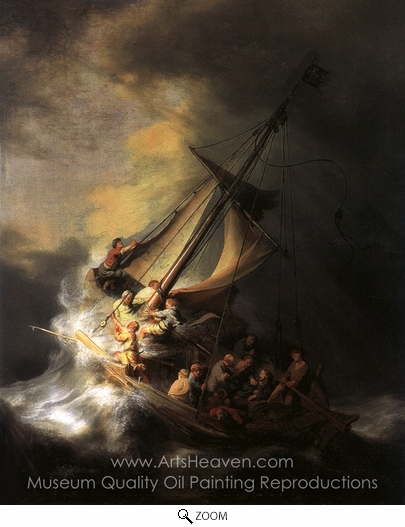 Decorate your home or office with our beautiful museum quality art reproduction of Rembrandt Van Rijn Christ in the Storm on the Sea of Galilee painting. Why settle for a print, poster, giclee or canvas transfer when you can grace your walls with a genuine oil on canvas painting reproductions for sale at up to 75% below gallery prices. You are commissioning an authentic hand-painted oil painting on quality artists canvas. Painted by professional artists brushstroke-by-brushstroke with attention to all details. Order your Masterpiece today and get Free Shipping to your door direct from our studio.